Batman doesn't laugh. He's a man filled with regret, a character built on pathos. After James Bond, he has become one of the most portrayed icons in cinema. What opportunities could Ben Affleck, two-time Oscar winner and auteur director, have possibly seen in taking on this most beloved of roles? Everything. How perfect for one of Hollywood's most successful leading men to play the ultimate bachelor, Bruce Wayne. Art imitates life, and in Batman V Superman: Dawn of Justice, Affleck brings a blend of weariness and rage to the caped crusader, saying: "I've seen it all and I'm not impressed." Part beast and all anger, Affleck's Batman lifts the character to a new echelon of comic book portrayals. He is not to be taunted. 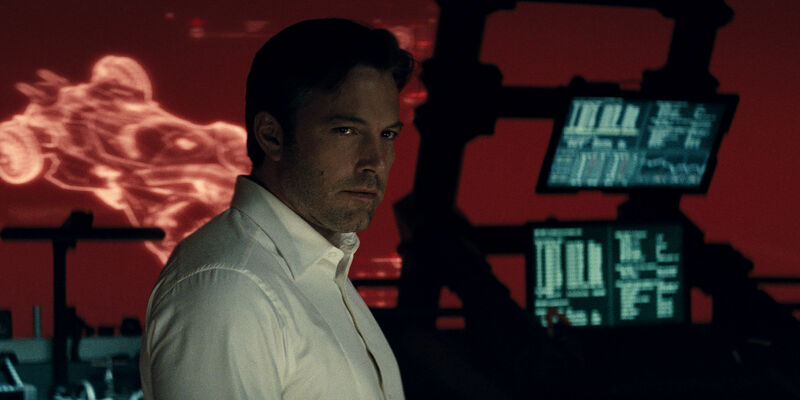 Here is our list for Batman V Superman: 11 Ways Ben Affleck Reinvented Bruce Wayne. While his depiction in the comic books may differ from his portrayal onscreen, Batman has long stood by his "one rule." Barring a few rare exceptions (Tim Burton's Batman being the most notable), he may break, maim and threaten his foes, but Batman will not kill. The Christopher Nolan trilogy took Batman to the one yard-line of murder, letting the Joker free fall just long enough to taste the fear of death. Even then, Batman reinforced his fealty to justice and let the clown freak live. As with Superman in Man of Steel, Zack Snyder allows his version of Batman to kill. While the body count is highest in the post-apocalyptic Knightmare dream sequence (replete with a snapped neck), Affleck's Batman rampages through Gotham with no fear of collateral damage. His seemingly-indestructible Batmobile sends countless thugs to an early grave, affirming that Affleck's Batman is simply exhausted, impatient and beyond the pale philosophical concepts of peace. This Batman doesn't go spelunking, use staplers in lieu of guns, or go base jumping sans-Batsuit. When we meet Ben Affleck's Dark Knight, he is well versed in his ways. The Batcave is already built, his gadgets, vehicles and weapons are in order, and his butler, Alfred Pennyworth, calls him old. Affleck's Batman isn't readily excited by his duties, bound to their reinforcement out of a lack of lifestyle diversity. Thanks to Zack Snyder's gutsy in media res introduction, we meet Affleck's Batman with an assumed history, more of an old friend than new acquaintance. Marked by deep-set scars on his hulking frame, this Batman doesn't talk about his past because he wears it on his blood-stained sleeves. "I'm older now than my father ever was..."
Alfred Pennyworth's avuncular relationship with Bruce Wayne often values conversation as much as action. Batman V Superman: Dawn of Justice gives the trusted butler a chance to shine, piloting Batman's aircraft and positioning him for maximum effectiveness. It's the private scenes that resonate most, however, and separate Affleck's portrayal from the actors who have come before him. Christian Bale may have flown a nuclear device out to sea, but Affleck's Batman is dead behind the eyes. While his spirit may have perished with his parents, he has died many times over since grappling with Gotham's underground. When his dormant enthusiasm is awakened by the perceived threat of Superman, he prepares as if going to a title match, the fight that may end his life. He's older than his father ever was, and as the Wayne family's life span goes, that's good enough for him. 8 He Has His Own "Brand"
Batman literally sizzles in the final moments of Batman V Superman: Dawn of Justice. Holding a red-hot branding device with his signature bat logo, he threatens Lex Luthor's (Jesse Eisenberg) pallid skin. We know he's not afraid to use it, as his first victim in the movie bears a fleshy keepsake from his momentary tussle with the Caped Crusader. Batman's custom cattle-brander reflects his grim outlook on the criminal world. They are no better than animals, and in describing them as "weeds" to Alfred, he knows they'll keep coming back. The notion of a recidivist criminal is redundant, so Ben Affleck's Batman chooses to cauterize them with the wing-tipped brand of justice once and for all. Batman V Superman: Dawn of Justice tackled the Brobdingnagian task of building the DC Universe (it seemed like the only chance we'll ever have to use that word). Along with introducing the star players of the Justice League, Zack Snyder incorporated an aged Batman into Superman's already established universe and blended in just enough villainy to make things interesting. Capitalizing on the beautifully contorted and chaotic "Knightmares" from the comics, Zack Snyder makes Ben Affleck's Batman suffer while he sleeps. Beyond providing a deeper look into the tormented mind of Bruce Wayne, these Knightmares broadened the scope of BvS by subtly introducing the DC archenemy, Darkseid. The Omega to Batman's Alpha, Darkseid's reign of terror is on full display in this dystopian image of life, whether it's in post-apocalyptic Gotham, on another planet, or even an alternate reality. The Knightmares have yet to be fully explained, but as the dust settles from the BvS premiere, and as Snyder's team films The Justice League Part One, expect to have your questions answered. In Batman V Superman: Dawn of Justice, the real-world devastation of terror attacks like 9/11 are retrofitted for superhero involvement. When Ben Affleck's Batman watches Metropolis burn, and his own company's building get physically halved, he witnesses the horrific deaths of people he knew and loved. Running through the smoke and ember to reach the crash site, Bruce Wayne saves a little girl from collapsing metallic beams. He asks where he can find her mother. She points upwards to where Wayne Financial stood just moments ago. No wonder, then, that when Batman sees Superman vaulting across Metropolis's pummeled skyline, he identifies him as the world's greatest threat. In contrast to previous cinematic versions of Batman, Affleck's portrayal is perhaps the most deserving of that unholy anger and righteous commitment to defending the people he cares about. You don't dare pull a John Deere tractor tire unless you're preparing for war. Ben Affleck's physical commitment to portraying Batman is exemplary, but it goes beyond simple aesthetics. Zack Snyder directed a great montage of Affleck's Batman training, focusing less on the look of things and more on what they symbolized: rebirth and renewal on the path to revenge. Whether squatting, pulling or curling, Affleck's Batman relishes dropping the weights as if each set were a maxed out single-repetition. When he screams, he means it. The man-roar is cathartic for his ramping frustration and boundless wrath. Even if Affleck heightened the effect by ditching XL clothes for that Abercrombie muscle shirt, once he decides to kill Superman, he starts walking with swagger. Throw on the mech suit and you're looking at a one-man killing machine with no contingency plan. Moments before he gets semi-paralyzed in The Dark Knight Rises, Christian Bale's Batman seems foolish. He trusts the kleptomaniac Catwoman and ends up finding himself locked in a stadium cage with Bane. This lack of planning and foresight would never happen to Affleck's Batman, who demonstrates a brilliant approach to dismantling the red-caped demigod. Beyond mere braun, this Batman shows a cunning ability to amplify his human nature into something truly lethal. In addition to building kryptonite grenades and fashioning a krypto-spear for Superman's death blow, Affleck's Batman sets up automatic turrets, kryptonite IEDs, and more. He also hacks into Lex Luthor's digital mainframe and uses trailing cars as two-ton hammers. Say what you want about the movie, but Affleck's Batman sure knows how to have fun. Everyone knows about Kryptonite, even 3 Doors Down. To dethrone Superman, Affleck's Batman needs a healthy dose of the shiny, emerald rock. The first half of the movie plays out like a modern gold rush, with multiple parties seeking the green stuff from outer space. Bruce Wayne wields his wealth to harness the power of kryptonite, turning his war chest of toys into an anti-Superman arsenal. In addition to his smoke bombs, guns, sniper rifles and more, Batman V Superman: Dawn of Justice gives Ben Affleck the keys to the kingdom. Flying around in his Batwing (drone-mode included for Mr. Pennyworth) and tearing up the streets in his speedster-tank Batmobile, Ben Affleck gets a lot more to play with then the curiously tepid toys from Nolan's trilogy. Gone are the "light-switch" electromagnetic guns, replaced by mech suits and weapons designed to kill. We first meet Bruce Wayne, the man, exiting a moving helicopter. He runs onto the helipad and commanders an SUV to drive towards the destruction of Metropolis. On the phone with Jack, a Wayne Financial executive, he begs the man to evacuate his offices and get to safety. Jack hesitates, and minutes later, finds himself whispering his final prayer. In stark comparison to Nolan's trilogy, where Bruce Wayne intentionally besmirched his public reputation, Affleck's interpretation is of a man who loves his company and feels responsible for his people. That's why he cuts monthly checks to people like Wallace Keefe. Affleck's Batman is more a man of the people and less an iconoclast than ever before, though he is still ultimately an island unto himself. Batman V Superman: Dawn of Justice has been pilloried for its brashness, yet rarely praised for its subtlety. Ben Affleck's embodiment of Bruce Wayne and Batman are driven home by quiet moments with Alfred, Diana Prince and others. The moment after Wayne awakes from his second Knightmare, he reaches to a nightstand to finish a glass of wine. As he drinks it, we see the curvaceous outline of his bedfellow, who remains nameless, faceless and otherwise inessential to the story. Still, those brief moments give Bruce Wayne a more detailed life outside the cape and cowl. When he tells Diana Prince, "I know a few women like you," we understand that Affleck's Batman has been in the game for many years. He's seen it all and he's not impressed, but for some unearthly reason, he's driven to continue being Batman. What other ways did Ben Affleck redefine the role of Batman? Let us know in the comments below!